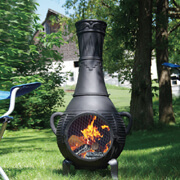 The Blue Rooster Chiminea Outdoor Fireplaces Cast Aluminum Cast Iron . 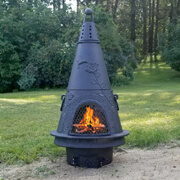 Pine Chiminea from The Blue Rooster Co.
A unique south west design with an eclectic mix of features, the Pine chiminea compliments its surroundings with solid built in handles and round mouth opening. Stoking the fire will keep the guests outdoors long after the sun goes down. Perfect in size to create a romantic patio setting or compliment a weekend getaway. 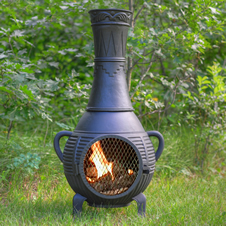 Choose a gas or wood burning chiminea model below for more pictures and complete details.